The patented design of the Perfect Brownie Baking Pan bakes each piece separately so they are flakey and crispy on the outside, but rich and gooey on the inside. The non-stick divider is so slippery not even yummy marshmallow treats will stick! 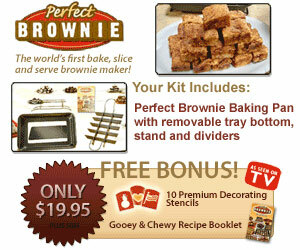 Turn your Perfect Brownie Baking Pan into the ultimate party serving tray! Just drop down the sides and the bottom stays up on a pedestal. Perfect for tasty toppings at a birthday party. Make a chocolaty marble swirl for a graduation or e scrumptious double fudge brownies for the most successful e sale ever! Now serve irresistible holiday mint, mouthwatering peanut butter or 18 chocolate-vanilla checkerboard brownies all without ever using a knife.